He drives a flying car. He carries around a portal gun. He fights aliens on the regular. He drags his timid teenage grandson along for the ride on most of his adventures. Oh, and he always seems to have a comical response to any situation! It’s safe to say that Rick Sanchez leads a pretty interesting life. It’s really no wonder that your child would want to lead a life like Rick’s! Of course, the real Rick Sanchez is constantly in harm’s way, so you might not want your child to be exactly like Rick! After all, most of the aliens he encounters end up trying to destroy him. But that is exactly why this child Rick and Morty Rick costume is one handy outfit! It helps your child feel like the main character from the cartoon series, but with none of the added danger of being Rick Sanchez. This officially licensed costume comes with everything you need to turn your child into Rick Sanchez! The included lab coat has an attached turquoise shirt front. Of course, your child is also going to want to have Rick’s unibrow and wacky hairstyle, both of which come pre-molded into the mask. The mask also has Rick’s wacky facial expression and a little green drool on his bottom lip. It has mesh in the eyes for vision and it fits with an elastic band. So, if your child is raring to go on adventures to other dimensions filled with dangerous aliens and maybe a few friendly Mr. Meeseeks, then your young one is ready for this Rick and Morty costume. 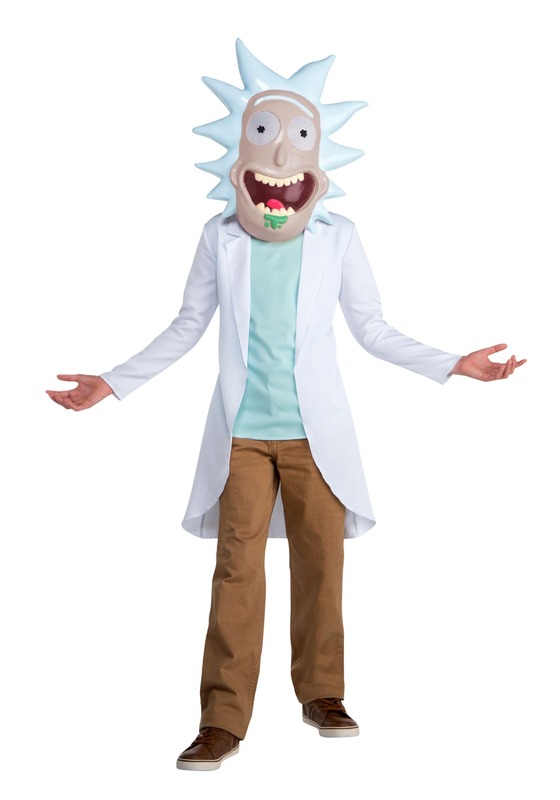 If you want to go all out, check out our Morty costumes so you can head out on the next wacky quest with your young interdimensional adventurer. Lab coat and shirt were too thin and looked cheaply made.